19 May 2015 was a significant day in the history of Nepal Jesuits. As a response to the devastating earthquake and its consequences, Nepal Jesuits established and inaugurated Nepal Jesuit Social Institute (NJSI). 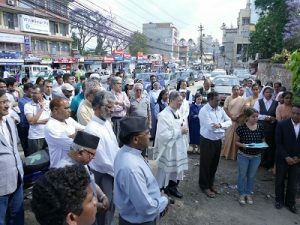 NJSI is born out of Nepal Jesuits’ desire to respond systematically and effectively to the tragedy that devastated the country after 25 April. At an informal ceremony Bishop Paul Simick blessed the new Institute and Bishop Emeritus Anthony Sharma SJ offered special prayers. Mr. Suresh Adhikari (Joint Secretaty General Administration Ministry, below) was the chief guest. In his inaugural address he expressed his hope that NJSI would take a lead role in the ongoing relief and rehabilitation operations in the country. He also asked NJSI to extend its expertise to assist thousands of traumatized children to return to school and continue their studies. In 14 worst affected districts, only a few schools and health centres remain. “This is an unusual time. Unusual times demand unusual response,” said Fr. George Pattery SJ, Provincial of South Asia, in his speech wishing the Institute every success in its ministry. Around hundred people, consisting of Priests, Sisters, well- wishers and friends attended the function (pictured above left). At present NJSI is putting together a detailed, long term recovery and rehabilitation programme for the victims. Fr. Boby Joseph SJ is the coordinator of NJSI. After the first phase of emergency relief operations, the Jesuits are focusing now on recovery and rehabilitation. A group of St. Xavier’s College student volunteers have gone to three districts: Lalitpur, Sindhupalchok and Dhading for village assessment. Their survey will determine, the next course of action. NJSI hopes to adopt some villages for long term recovery and rehabilitation. They are also in the process of setting up psycho-social recovery centers in some of the worst affected districts. In the mean time, St. Xavier’s College, in association with Catholic Health Association, India (CHAI) medical team, continue to offer medical services to those in need. The team went to Semjong, directly north of Kathmandu and set up a four day medical camp where over 300 quake victims came for treatment. One young man in the village was electrocuted and was airlifted to Kathmandu for treatment.